So that’s why my husband is dotty…. Scifi hubby is obsessed by dots…. I don’t mean polka dots, or spots I mean the three dots you put at the end of a sentence to signify an unfinished thought or missing words…. Apparently they are called ‘ellipsis’…. He puts them on the end of every sentence…. Just like this paragraph…. Now this obsession has me jumping up and down in grammatical rage already as he really over uses them. They are on every Facebook status, text message, email, everywhere. He’s driving me nuts. But it gets worse. Can you spot what is wrong with the dots in the first paragraph? It’s not just that they are at the end of every sentence but he uses four dots not three. ARGH! WRONG WRONG WRONG! He’s driven me crazy with this for years. I started to think he was only doing it to wind me up but I’ve just discovered he actually has a reason for it. One that makes sense in a very geeky kind of way. Now if you already now what I’m about to type you can officially class yourself as a fully qualified super-geek. 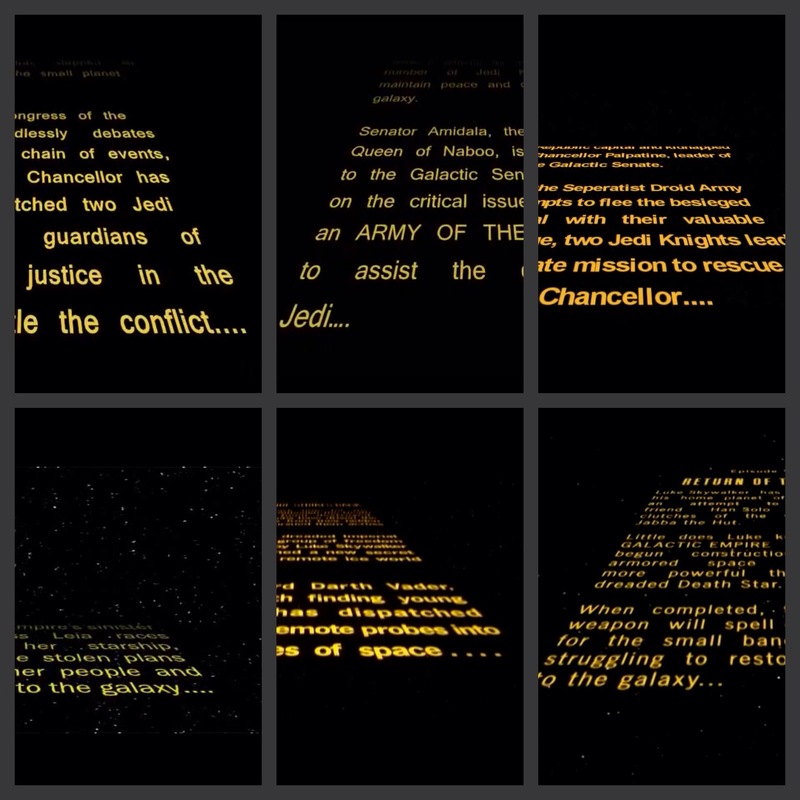 He put Star Wars on DVD this weekend and for the first time I really paid attention to the start of the credits. 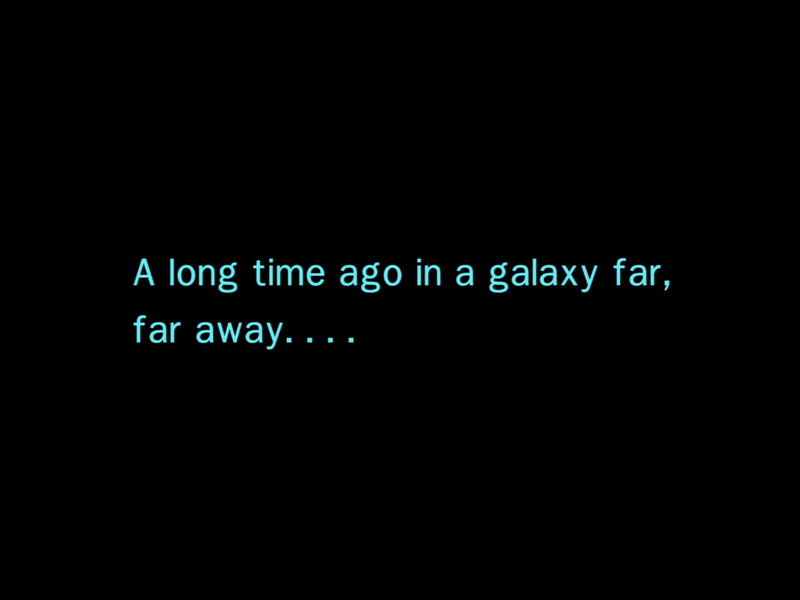 Everyone knows the yellow text scrolling up the screen: “A long time ago in a galaxy far far away…” But have you ever properly looked at it? If you look closely it doesn’t say “A long time ago in a galaxy far far away…”. It says “A long time ago in a galaxy far far away….” Yes there’s an extra dot. It gets worse. The yellow scrolling text finishes with four dots each time too. For bonus super-geek points there’s one movie that only has three dots at the end of the the yellow scroll. Thanks George Lucas. Now I know why it’s four not three it’s driving me a little less crazy. I just need to wean him off using them on every sentence. P.S. If you can tell me what’s wrong with the scroll photos you get even more super-geek points….